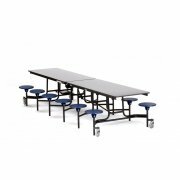 Cafeteria tables with stools from National Public Seating offer some personal space in a busy lunchroom. Their user-friendly design and durable build support many years of constant use. A torsion-bar mechanism facilitates a one-person fold, with an automatic lock in both the open and closed positions to prevent accidents. 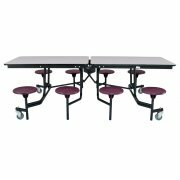 Heavy-duty wheels lift off the floor when the table is opened to prevent sliding and tripping. 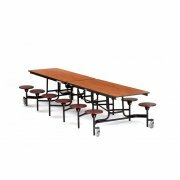 Every part of these cafeteria tables is constructed with practical, robust materials. Laminate tabletops with a phenolic backer are supported by steel aprons. High-impact stools with extra-large ribs are secured by a custom flange washer, bolt and lock nut. Steel frames are assembled with tamper-free hardware. 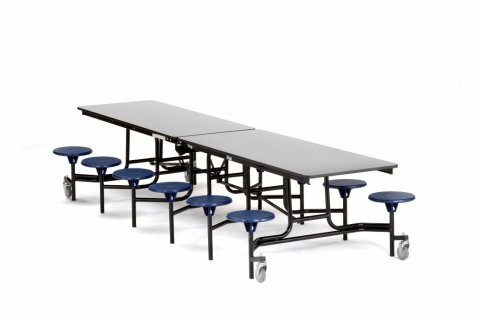 When it comes to set up, clean up and everything in between, these lunchroom tables get the job done right.